But tasting my first two coconut macaroon attempts side by side, I knew I’d be back in the kitchen, tweaking amounts of sugar and coconut until I arrived at chewy, coconutty perfection. And, yes, adding chocolate to them. First, they must be crispy on the outside and chewy on the inside. The version I made with whole eggs gave the macaroons a softer, way less crispy texture than the versions made with only egg whites. I think David Leibovitz’s technique of warming the batter in a skillet, then cooling it before you shape the macaroons for baking, also contributes to the chewy-crispy balance. Second, macaroons must not be overly sweet. Using unsweetened coconut (and bittersweet chocolate if you make the chocolate variety) helps keeps the sweetness in check. A lot of recipes use sweetened condensed milk, but my teeth ache just thinking about that. Let’s just stick to as little real sugar as we can get away with. Third, they are preferably not only gluten free, but grain free. I know several macaroon recipes use a small amount wheat flour to act as a binder for the coconut and eggs. In in my case, with nut allergies, gluten sensitivities and grain-free enthusiasts in my circles, I need to adapt. Happily, almond or coconut flour substitute for all-purpose flour just fine. Is it any surprise that my favorite chewy coconut macaroon had not just a drizzle of chocolate on top, but rather full-on bittersweet chocolate and cocoa in every bite? The recipe below gives you both options — straight up coconut or intense chocolately coconut. 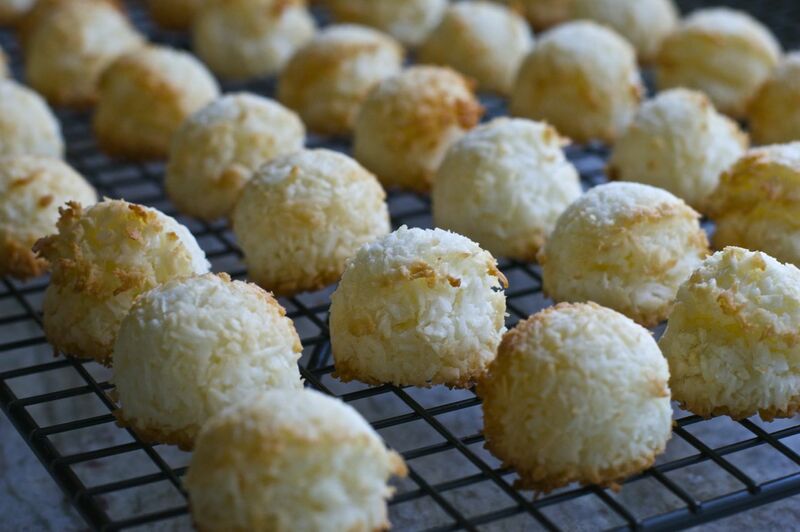 Try one, and see if you can resist getting started on your own coconut macaroon obsession. Here is crispy-chewy coconut macaroon perfection, made grain free thanks to the almond or coconut flour substituted for all-purpose. 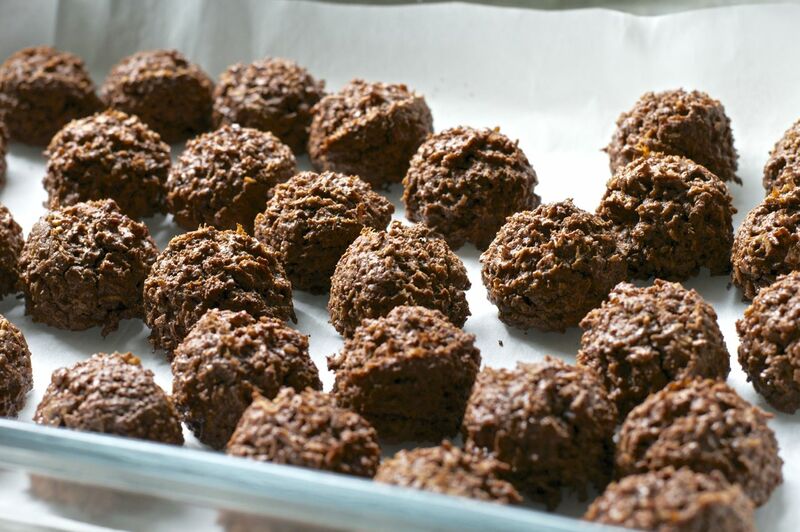 You can make either plain coconut macaroons or chocolate coconut macaroons by adding some melted chocolate and cocoa powder. For an added finish, a drizzle of bittersweet chocolate makes them even more heavenly. This recipe is adapted from David Lebovitz's Coconut Macaroons. 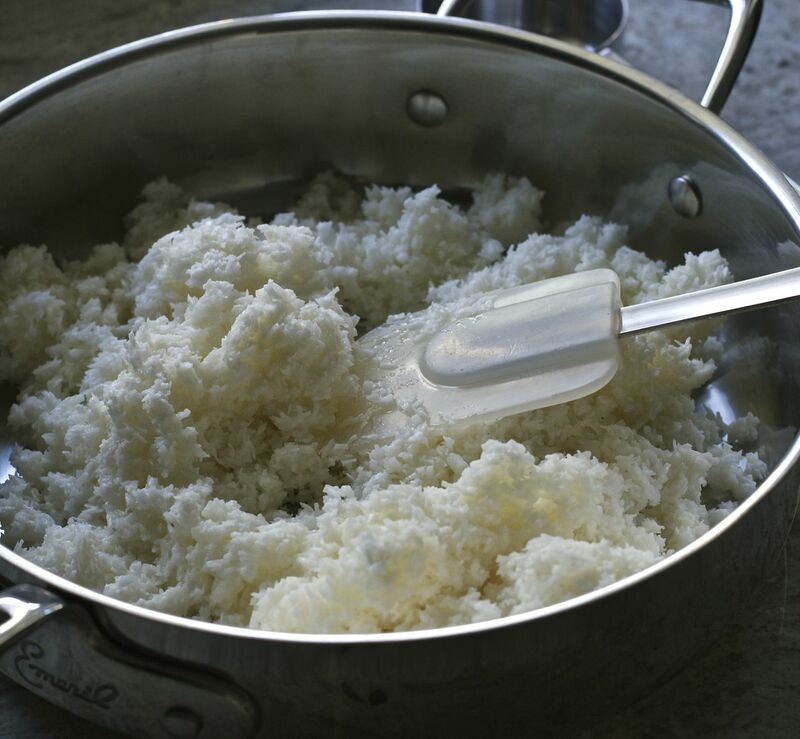 In a large skillet or sauté pan, place egg whites, sugar, salt, honey, coconut, and almond (or coconut) flour. If making the chocolate macaroon version, add the cooled 4 ounces melted chocolate and the cocoa powder. Heat batter over low to medium-low heat, stirring constantly. Make sure you scrape the bottom so that the egg whites don't start to cook too much. After about 8-10 minutes the mixture will be slightly thicker and drier, but should not have browned. 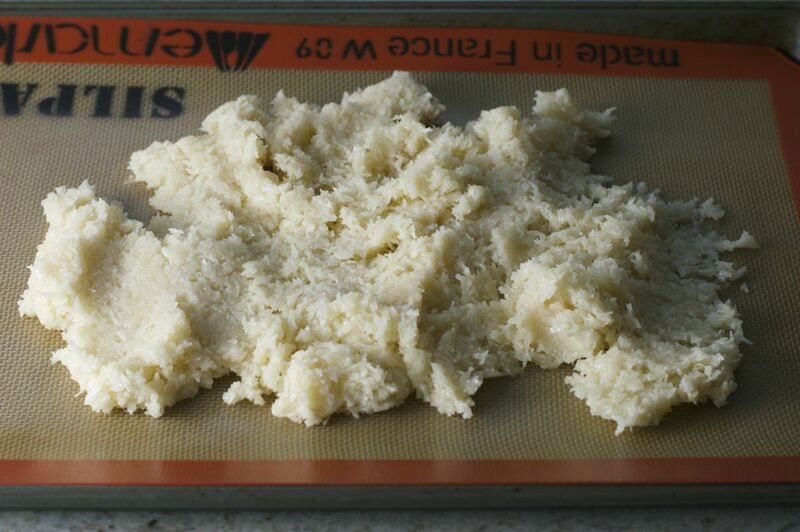 Remove the skillet from the heat, stir in the vanilla and spread mixture out onto a parchment or silicone-lined tray. Let cool for 20-30 minutes, or until cool enough to touch with your hands. Preheat oven to 350F and line a baking tray with parchment. Using a tablespoon (or a #70 scoop, about 1-1/4" in diameter for less rustic look), pack batter tightly and scoop macaroons out onto your tray, leaving 1-1/2" between each one. Bake for 12-14 minutes, or until macaroons are slightly browned. Remove from oven and transfer macaroons to a cooling rack. Melt and cool the 2 ounces chocolate, either in a microwave or on very low heat in a small saucepan. 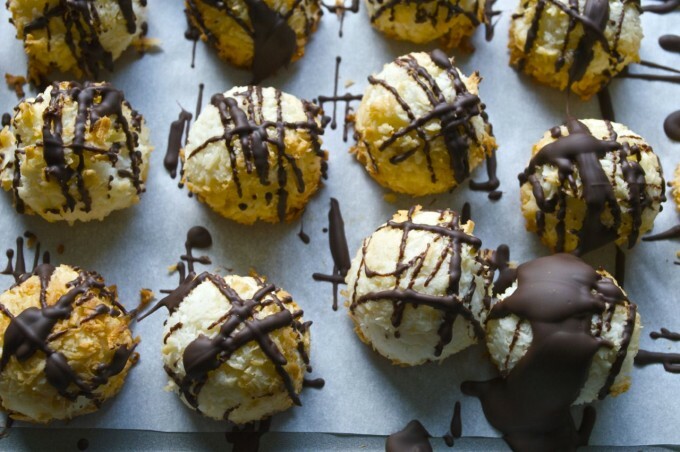 Using a teaspoon, quickly drizzle the cooled macaroons with the chocolate. For an even chewier result, under bake the macaroons a few minutes. You can also use a Tbs or two of arrowroot powder as a gluten-free binder (in place of flour, almond flour or coconut flour). Great point, Beth! Thanks — I should try that next time!